With the US economy improving and the unemployment rate expected to fall to the 4 percent range, maintaining interest rates near zero risks destructive asset-price bubbles, according to a Federal Reserve official. 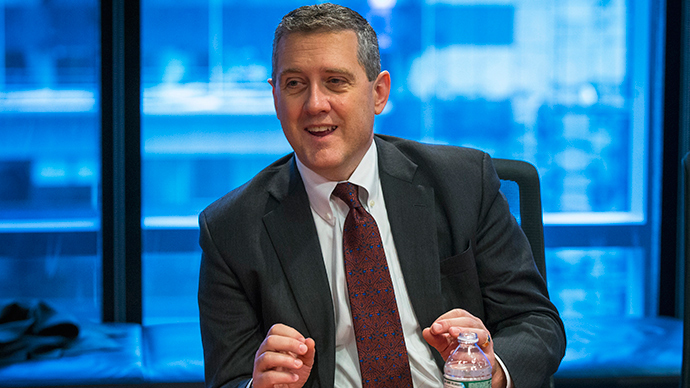 The Federal Reserve should start raising interest rates soon as keeping the rates low for a long time can lead to financial-stability problems later, St. Louis Fed President James Bullard said speaking at the annual Hyman Minsky conference on Wednesday. "A risk of remaining at the zero lower boundary too long is that a significant asset market bubble will develop,” Bullard said. It is quite a good time to “begin normalizing US monetary policy,” so that it is “set appropriately for an improving economy over the next two years,” according to Bullard. He doesn’t exclude the possibility the economy could see a shock that could hurt growth and kill the recovery. Bullard expects the US economy to maintain 3 percent growth in the medium-term and thinks that interest rates should reflect this. Labor markets continue to improve and are approaching or even exceeding normal performance levels, Bullard said. Bullard expects the unemployment rate to fall below 5 percent.The US jobless rate remained at 5.5 percent in March with long-term unemployment dropping to 1.6 percent, which was 0.7 percentage points below its level from a year ago. Employers last month added a lower-than-expected 126,000 jobs which was half of an average month in 2014. Experts said growth in March would likely mean the Federal Reserve would keep interest rates near zero for a while longer. The Federal Reserve last month said it was ready to raise rates no sooner than June. It continues to keep rates near zero where they have been since the 2008 financial crisis. After the crisis hit the US stock market and share indexes tumbled. The Federal Reserve fought back with low interest rates and a stimulus plan, which ushered in recovery in the stock market and the economy.